The new Walk the Prank TV series officially debuts Wednesday, April 6, at 8:30pm, but Disney XD and Disney Channel will “sneak preview” the series premiere, Friday, April 1, 2016 at 6:00pm and 9:30pm. 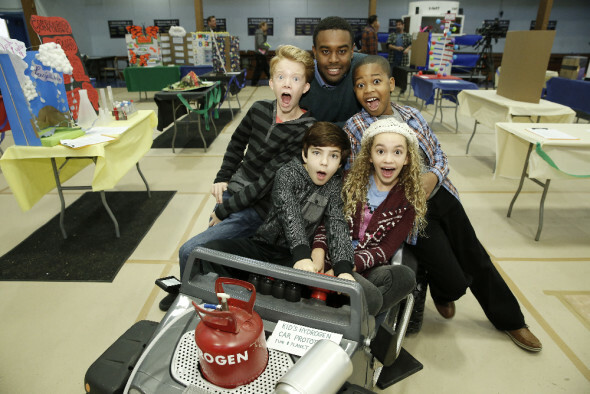 The Walk the Prank cast — Cody Veith, Bryce Gheisar, Jillian Shea Spaeder, Brandon Severs, and Tobie Windham — will host the sneak preview. Watch this trailer for Disney XD’s new Walk the Prank TV show. Disney XD and Disney Channel will debut a “sneak preview” of the innovative new series that blends scripted comedy with real hidden-camera pranks, “Walk the Prank,” on April Fools’ Day, FRIDAY, APRIL 1 (6:00 p.m. and 9:30 p.m. EDT). The “Walk the Prank” cast Cody Veith (“Nicky, Ricky, Dicky & Dawn”), Bryce Gheisar (“A Dog’s Purpose”), Jillian Shea Spaeder (“Theatre and Me’s the Bully”), Brandon Severs (“The Neighbors”) and Tobie Windham (“The Wesley’s”) will host the sneak preview. Disney XD will also air prank-themed episodes of its popular series “Gamer’s Guide to Pretty Much Everything” and “Lab Rats: Bionic Island,” among others. Following the sneak preview, “Walk the Prank” will air in its regular time slot on Wednesday nights at 8:30 p.m. EDT on Disney XD. What do you think? Do you plan to watch the early viewing of the Walk the Prank TV show premiere. More about: Disney XD TV shows: canceled or renewed?, Walk the Prank, Walk the Prank: canceled or renewed? What annoys me the most is the obsession this show puts on technology and that nothing else matters to these kids. One girl cries and can’t ‘live’ without her touch screen phone they all have and it just is a bad message. What happened to Disney Movies? This is probably the most horrible Disney show ever. The pranks are horrific, the kids are dreadful, the mix between acting and reality pathetic and annoying. My teenage daughter hates it, too. Seriously moronic. Funny that Disney has one of the best ever in “Girl Meets World” and one of the worst with this. I agree! The pranks were torturous and not funny at all. I was completely disappointed in Disney for making such a horrific show. Jeez, I’m shocked on the amount of negative reviews this show has. This show is great in so many ways. The parents that are so against this have to remember that they can’t shelter their children forever. They see and hear FAR MUCH worse things in public schools whether you want to believe it or not. This show is simply, fun, funny, creative and did I say, “FUN? ?” Which, by the way what we as parents should be embracing. Let your kids be kids and live a little…. This is on Disney XD not the Disney Channel. Disney XD is aimed at tweens so it is age appropriate for that audience. It is just the kind of thing tweens like. Disney Channel is blocked because of this walk the prank.. it’s not funny when it’s a real life birth trauma… this has gone too far… “mother” NOT FUNNY . women are really being ripped apart in in hospitals. I cry ever time it would advertise. JUST HORRIBLE !!!!! This is a horrible show and should be cancelled. Not age appropriate at all. First Disney show in 10 years it refuse to let my kids watch. Awful message! Kids are bratty (more than normal for Disney), rude and bullies. Cancel it! Disappointed that the Disney channel doesn’t put on any of their old shows or movies… so no, I don’t plan to watch this. Oh and I don’t like pranks, hidden or otherwise. Why make fun of other people? wow! someone finally agrees with me! I agree! walk the prank is awful! some pranks can be funny… but taking pranks too far? that is just wrong!